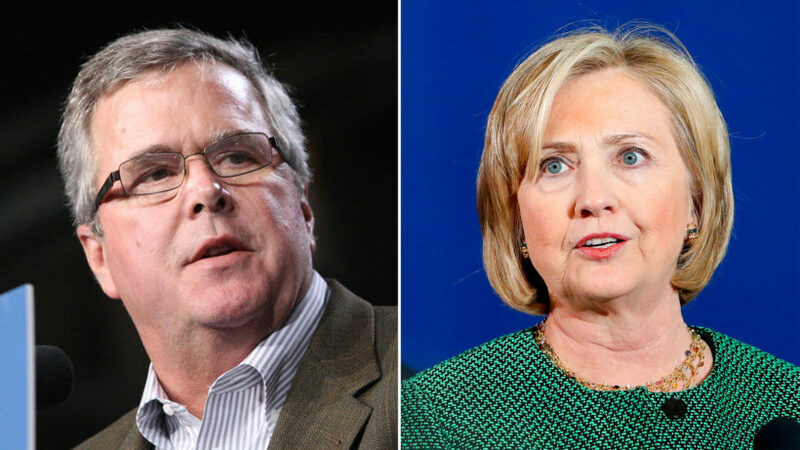 Jeb Bush and Hillary Clinton. Fox’s Brian Kilmeade asked the presumptive 2016 GOP presidential candidate if he’d read an article in the New York Times, which reported that leaders from America’s Christian right were unhappy with Bush and sought to back another candidate. “I don’t read The New York Times to be honest with you, so I guess you’re going to force me to do so,” Bush said. We can think of two. First, is Bush really on the receiving end of this “gotcha”? It seems to us that the Times reporters are the ones who come out looking more foolish – as if they’re genuinely bothered by the suggestion that a politician wouldn’t read their paper. Second, is the New York Times going to do this to other candidates? When will Times reporters Barbaro and Willis start checking former Secretary of State Hillary Clinton’s statements against her email archives? 1. It has been revealed that while Secretary of State, assumed presidential candidate Hillary Clinton did not use a State Department email address and refused to grant access to her email account and private server she maintained from her home. Instead, she gave the Congressional committee who requested access to her official correspondence only paper copies of her work-related emails. Do you think Mr. Taranto’s question: “When will Times reporters Barbaro and Willis start checking former Secretary of State Hillary Clinton’s statements against her email archives” is legitimate? Explain your answer. 2. a) What type of bias is Mr. Taranto implying the Times reporters exhibit? b) Do you think this is a fair assertion? Explain your answer. 2. a) Mr. Taranto implies that the Times reporters exhibit bias by story selection; that the reporters only investigated Jeb Bush’s emails because he is a Republican and that they will not investigate the controversy over Democratic (assumed to be) presidential candidate Hillary Clinton’s email claims.